Tastes like the junk food chips you love but have to avoid because of the poor nutrition. Our Tangy Ranch Seasoned Almonds allow you to indulge and enjoy life without compromising your healthy lifestyle. No, there are no diet foods here, full of fillers and artificial flavors. Our ranch flavored almonds are made of 100% natural, healthy ingredients that will fuel your body whether you're running a 5K, gearing up for a hike, or chasing your kids around the house. Eating nuts as part of your regular diet can help you lead a healthy lifestyle and have numerous benefits to human health. 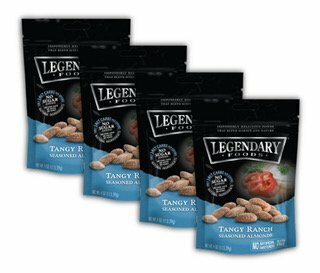 Legendary Foods produces raw flavored nut snacks that are packed full of nutrients without adding unnecessary sugar. Our raw paleo nuts provide you with a low carb, healthy fats snack that can help curb your appetite and cravings for junk food. THE LOW CARB HIGH PROTEIN OPTION | Our carefully crafted butters have no added sugars and are high in magnesium. A great low carb option to use between meals or to refuel after a workout. They taste like junk food but are actually a healthy snack. So whether you're into paleo, low carb, or healthy fat diets, this butter is for you. ALL NATURAL FLAVORS | All of our flavored nut butters are seasoned with ingredients only found in nature. So you can enjoy the great taste of blueberry flavored with cinnamon without adding to your waistline. We're also different from many producers because when nuts are traditionally roasted the fats inside become compromised by the excessive heat. We only use the minimum heat to ensure the maximum nutritional benefits for our customers. If you have any questions about this product by Legendary Foods, contact us by completing and submitting the form below. If you are looking for a specif part number, please include it with your message.